This summer’s biggest roof-terrace success Pergola on the Roof is thrilled to announce that due to high demand, they will be extending their residency on top of the Television Centre until the first weekend of October 2016. 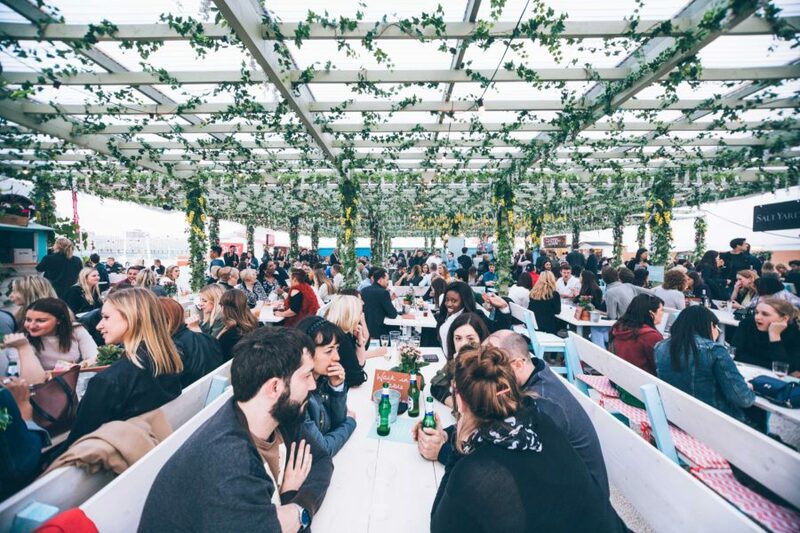 Launched in May this year as the biggest temporary pergola in Europe, Pergola on the Roof has become one of the Capital’s most talked about destinations, after completely transforming this West-London rooftop into the ultimate summer experience of 2016. In partnership with some of London’s finest restaurants, including award-winning charcuterie and bar Salt Yard, Caribbean beach shack eatery Rum Kitchen, and ‘wild and foraged food’ restaurant Rabbit as well as London’s legendary burger joint Patty & Bun, Pergola on the Roof will continue to offer their deliciously designed, bespoke menus for the entirety of the residency alongside the central bar offering, including a range of cocktails, bubbles, beers, ciders and wines, as well as an obligatory roaming drinks trolley. Taking bookings for six people or more, Pergola on the Roof offers tables for up to 10 people, as well as 5 giant sun-drenched day beds seating up to 12 people can be hired for a couple of hours, or all day long. With an Indian summer undoubtedly on the horizon, there’s never been a better time to book a table with friends, family or colleagues at this incredible 400-capacity venue, to enjoy the belated sunshine under a beautiful hanging garden of blossoming flowers, and into the evenings illuminated by trees that sparkle well into the night.